After payment you will immediately receive a scanned image of a key World of Warcraft: Wrath of the LICH KING to Russian servers. Master the necromantic Death Knight abilities (Death Knight) - the first hero class World of Warcraft. · Run the new quests to reach level 80, gain new skills and talents. · Explore new profession Inscription, «improving" spells. · To challenge the new continent of Northrend severe (Northrend), Cold-lands of the Lich King. · To participate in epic battles and sieges, using destructive siege equipment capable of destroying buildings. · Change the appearance of your character, including new hairstyles and dances. · Explore new dungeons populated by some of the deadliest creatures ... and complete capture the imagination of treasure around Azeroth. CAUTION This key can not be activated in the trial record !!! 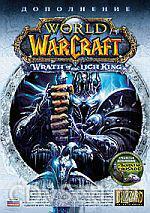 To play in Wrath of the Lich King is required to have on your computer and in your account have been installed basic version of World of Warcraft (Russian version), as well as the previous addition World of Warcraft: The Burning Crusade (Russian version). The key is not suitable for the American and European versions of the game!